First up, CoursePress comes with pretty much every element you could imagine needing to construct a course – ranging from video, audio and downloads to interactive elements like multiple choice, uploads, long form answers, forum style discussions and even live chat integration right there in your course (for live seminars or students just to hang out). Then we’ve made it really really simple to setup an absolutely beautiful course, both in terms of the UX and the front end output. When you activate the plugin you are guided through a helpful getting started experience that’ll have your first course set up in minutes, and then once you’ve got it together you can either choose to use the bundled theme for a beautiful course off the bat – or enjoy the fact that, like all WPMU DEV plugins, this works really well with pretty much any WordPress theme. And here’s the absolute clincher, you can actually sell courses and take credit card or PayPal payments… and you don’t even have to upgrade to be able to do it – CoursePress comes bundled with our ecommerce solution MarketPress that handles all of that for you seamlessly. Of course, there is a paid upgrade that allows you to create more courses and access more payment gateways, not to mention 400+ other premium plugins, themes, videos and our famous 24/7/365 support. But realistically you should be absolutely fine with the free version of CoursePress to get your elearning project off the ground. 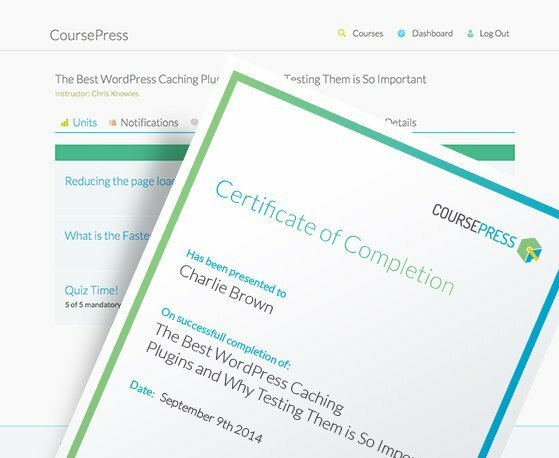 Download CoursePress at WordPress.org for free now! Great plugin ;) Will give it a try. Thanks! Yes :) Very much so! Can users buy multiple courses and have access to each one? James. Dude. This is probably the best I’ve seen come out of wpmudev in a while. Super impressed. A tool like this will empower me to fund a year-long membership w you guys. Thanks so much for staying creative and redefining the WordPress landscape. That’s awesome, we love hearing this stuff! Does this plugin give you the ability to access student assignments and give feedback on their answers? Does the plugin allow for dripped content, and/or payment options? Yes, you just schedule the units as you like. Okay, great, this is so timely, I’m just about to release a course, and I was having a heck of a time finding something other than a membership plugin that would even do half of what I needed. I’ll give it a shot! Please include as much detail as possible including the theme name, how to recreate, etc. Just a comment on your videos…I like fast and to-the-point but your videos transition too fast. I find myself having to pause each frame to digest what’s there. I Love WPMUDEV so no worries! Just a critique. Totally get that, I’m a pauser too, I need time to digest. Just my two cents: I’d much rather pause for each step rather than fast forward/search for the next step. How many courses can you create with the free version? I have been using some course ware that we designed in-house in which students post “Student Submissions” in fulfillment of the requirements of an assignment. These Student Submissions are WordPress custom post types that are linked via custom taxonomy to the individual course and assignment. Those Student Submissions are viewable for discussion/commenting by all students who are registered for that particular course – but no-one else except the course instructor. Is that something that could be done through CoursePress? If so, I’m in! I really like what I see in the admin interface. Yes, all student’s submissions are available under the Assessment page (and the student’s Workbook) within the administration area where an instructor may leave a comment and grade each answer / submission. Can student submissions also be open to the other students? Absolutely, but you’ll have to get them to submit in one of two ways. Brilliant, this looks fantastic. Is their a working demo site, I could take a look at? Great looking plugin which looks like it has everything you need. Does this need the membership plugin or can it stand alone? I have one other questions can you do installment payments or subscription service? You can use PayPal Credit (formally Bill me Later) to take staggered or instalment payments. And the Menu’s keep repeating. All this on a clean WP install. That error isn’t related to our plugin, the error there seems to come from your Academica theme as that’s the path the error goes to. This looks a pretty awesome plugin for my needs and I am really interested in the monthly membership offer as there are a few other plug-ins I could use. I have a wealth of training I am looking to offer and this looks like it is the right vehicle to do it from. I have set-up my first training course, but the whole site looks a bit ugly and is coming up with errors. Is there any training available for the free plugin and also a demo site so you can see the possibilities? Also, can you get help from your support group for the free version? I would like to get my first course looking right before committing to the pro version. Guys, how does this compare to the Sensei plugin that Woocommerce offers? I’d like to think it’s better… and is just going to get moreso from here on in. This looks great! Just got the free version. How can you do a live seminar component with it? As a full member of WPMU DEV you get both the full version of this CoursePress, Chat and 350+ other plugins and themes! Sound interesting and i will defo give this plug in a go. Just want to ask. I am about to set up site for online courses but with idea of involving other instructors to became teachers on it. Is your pro version support that? You could let instructors run their own courses on your single site. If you want them to sell the courses and take the cash themselves then you could consider a multisite setup, each instructor gets their own site. Does this work with the Paid Membership Pro plugin? Although you do get to apply some more interesting rules with Membership Pro. Also take a look at our new Protected Content plugin https://premium.wpmudev.org/project/protected-content/ – it’s still in beta but should do the job even better for ya! I am testing out the free version at the moment to see how it goes. So far it’s brilliant! I do have a question though, when a student is logged in there is a “WordPress” icon top left of screen and the drop down says “dashboard” which takes them to wordpress area similar to admin. Is there a way of getting rid of that so students don’t try and go there, I don’t really see the need for them to be there. I have downloaded a plugin to take care of the dashboard issue, so all sorted. I am continuing with my test course site but I reckon I will be buying the pro version very soon as I think this is a great plug in, and i’ve used all sort in the past, this is so easy to use and the front end looks really professional. Hi Alan, which plugin did you download to take care of the dashboard issue? Just wondering – will you be doing a comparison of CoursePress Pro vs the other LMS plugins out there? (Seeing an infographic, or chart to see how they compare, similar to this one: http://wptrainup.co.uk/purchase/lms-comparison/ would be AWESOME). Since CPPro is fairly new to the game, I have yet to see any comparisons, and would LOVE to see a blog post about this. Enjoy the rest of your day Dinnae! But yeah, I already posted in the forums requesting a blog post here: https://premium.wpmudev.org/forums/topic/coursepress-pro-comparison-post and Michelle already replied – she’s going to send the post idea to Rae. We are having trouble with the newest version of the premium WP-Courseware plugin from FlyPlugins. It does not work any more in our multisite. How difficult would it be to move existing WP-Courseware courses and quizzes into CoursePress? I have an important question, the plugin detects that there are several people connected with the same account? Expel any of them? In short, is there any way to prevent many people use the same account? Are there any analytics built into this so you can track what units/sections of your course which participants access? Not at this time, but it’s still possible, by passing a user ID into your Google Analytics settings. This can be done programmatically, or with the help of a WordPress Google Analytics plugin, like ours. We do have tools built into CoursePress to make it easy to monitor student progress, for both instructors and the students themselves, but you can easily extend that information with the help of Analytics. and is there a video tutorial provided by pro version ? As of right now, we don’t have a way to auto-enroll students. You can manually add them, or allow a few different enrollment processes for students to join on their own. I think this is a pretty interesting idea, however, I’ll pass it on to the CoursePress dev team. It totally is! I’ve got BuddyPress and CoursePress installed together on a test site right now. They’re both working fine together. They’re not directly integrated, so you won’t see your Course information as part of a BuddyPress profile (although that may be added down the line), but they work great side by side. i am an entrepreneur from saudi arabia and i am going to create a site where i offer different kind of paid courses . do you think this them is the right choice ? 1 – does the site support RTL? can you use it properly for fully Arabic content? and if so, how much would it take to convert it to Arabic? 2- what is the payment method? can i use more than just paypal? 3 – is it easy and flexible to develop and add some features? 5 – how much time does it take to make the site up and running? I am searching for a solution where user/teacher can handle/create their own courses like Udemy. Can CoursePress hanlde this?